P.T. 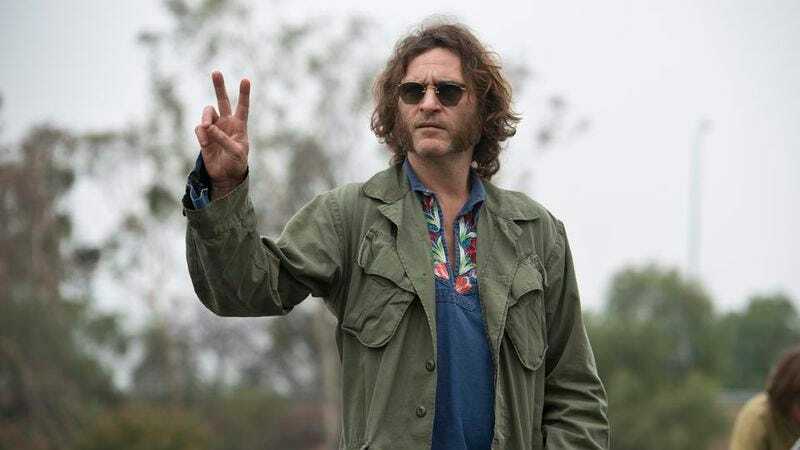 Anderson’s Inherent Vice—easily one of the most highly anticipated movies in years that doesn’t have any Iron Men or Star Warriors in it—doesn’t get a wide release until January 9, but fans of Thomas Pynchon, Joaquin Phoenix, and crazy sideburns can pass that time a little easier by listening to the movie’s soundtrack on Spotify. As we’ve previously reported, Radiohead’s Jonny Greenwood composed the music, and the soundtrack even features an unreleased Radiohead song. It’s not actually performed by Radiohead, though, with Greenwood and Supergrass’ Gaz Coombes and Danny Goffey taking over instead. Joanna Newsom, who plays Inherent Vice’s Sortilège, also shows up for some spoken-word segments. Neil Young, Can, and Minnie Ripperton contributed tracks as well. The soundtrack is available in stores now, or, as we said, you can stream it on Spotify. Or, even better, you can stream it right here and we can all just hang out and talk about the ‘70s. That was a weird decade, right?